We used our three little apples for some marvelous apple crisp. We used Jonagold apples. Add your peeled and sliced apples to a bowl with a splash of lemon juice to prevent browning. Add apples to 8" square pan sprayed with cooking spray. I used Baker's Joy and a round baking stone. In mixing bowl, combine flour, brown sugar, oats, cinnamon and nutmeg. Stir in butter and stir until crumbly. Bake 375 for 20-25 minutes or until apples are tender. 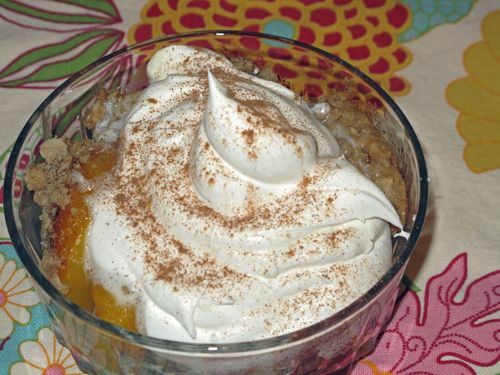 recipe adapted from Betty Crocker Apple Crisp.